The 25th Anniversary G.I.JOE figures have started hitting this area and I’ve been buying what I can. 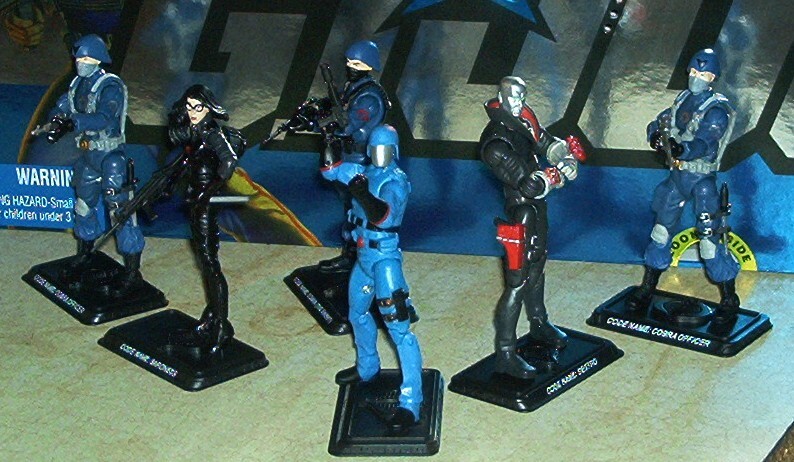 At this point, I have the Cobra set and the single pack versions of Snake-Eyes (pictured to the side), Storm Shadow, Cobra Commander (with the rag mask) and 2 Cobra Officers. It’s kinda weird that they put the Cobra (Trooper) in the Cobra set instead of the Officer since most people that buy multiples of the troops prefer to have more troopers than officers. It’s like workplace with 20 supervisors and one regular guy. The good news is that there is going to be a single-pack Cobra Trooper on the way later this year, but it’ll have a silver logo like the Viper glider pilot instead of the red trooper logo. Hey, as long that’s the only difference and they match the rest of the 5-pack trooper, I’m not going to gripe. These figures are far too cool for that. I plan to do a big mega post after I get the Joe 5-pack and Flint (hopefully after this next paycheck) with pictures and all that good stuff. One thing that I want to say is that I’ve seen sellers charging over $50 for the 5-packs but I bought mine from Toys ‘R Us (actual, not website) for $30. In fact, I’ve heard that some people have found them for cheaper than that. Do some price hunting if you really need to net-buy ’em. I’ve heard that the distribution on these are going to be good, so don’t get price-gouged out there.